Casino Hold’em is a poker variant perfect for players who don’t like the competitive nature involved with Texas Hold’em. It follows the same set of rules but you verse the dealer instead of other players. You can find it at land-based casinos, as well as online at secure Internet casinos. Online players can find this title at the leading secure online casinos, each governed by a third party to ensure player protection. 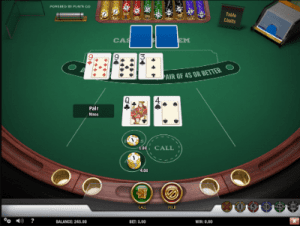 Casino Hold’em is a simple game to pick up even if you’ve never played Texas Hold’em before. The game is played with a standard deck of 52 cards with all jokers removed and the cards are ranked with the highest card being Ace (high or can be low), K , Q, J and 10 descending to 2. The deck is shuffled following every round and players get started by picking their chip size and placing a bet on the Ante spot on the table.There’s also the A-A Bonus spot for players to make an additional side bet provided they play the Ante bet. Then two cards facing upwards are dealt to the player, and two cards facing downwards are dealt to the dealer, while three community cards are dealt in the middle of the table facing upwards. The option to Call, where you double your initial bet, or Fold, where you forfeit your hand and lose your bet, then becomes available. Once you’ve made your decision the side bet is determined and wins if your hand has a pair or Aces or better. You will be paid accordingly and the game will continue or a new round will commence depending on whether you chose to Call or Fold. Two additional community cards are dealt – these are known as the Turn and River cards – and then the dealer’s hand is revealed. The winner is determined by comparing the hand with the dealer, who must have a pair of fours or better to qualify. If the dealer doesn’t qualify the player’s Ante and Call bets are returned and the player wins with the Ante bet according to the payouts, detailed below. This is also the case if the dealer does qualify but the player has a better hand. Additionally, if the dealer does qualify and has a better hand than the player then the player loses all bets. If the player and dealer have the same hand it is a ‘Push’ and the player receives both the Ante and Call bets back. Payouts can vary at land-based casinos and among online software providers so it is important to note the differences. NetEnt’s Casino Hold’em variant is available at Guts Casino offering table limits of a minimum of $1 and a maximum of $100 for the Ante and Call bets, while there’s a minimum of $1 and a maximum of $50 for the side bet. Additionally, the theoretical return to player is 98.75% for this version. Play’n Go also offer a Casino Hold’em variant which you can play for real money at Guts Casino. The table limits are the same as NetEnt’s version, at a minimum of $1 and a maximum of $100 for Ante and Call bets, and a minimum of $1 and maximum of $50 for the side bet, but the RTP is different. The main game has a RTP of 97.84% and 93.74% RTP for the bonus bet. 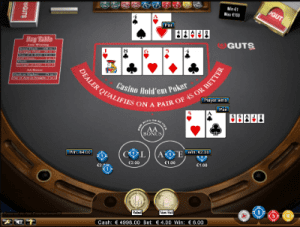 If you like the sound of playing against the dealer, but enjoy the elements land-based gaming offers – including a dealer guiding the game instead of Random Number Generator software – software providers offer live dealer versions of Casino Hold’em. Many of the top providers offer a live dealer Casino Hold’em variant and you can find these at our recommended online casinos. 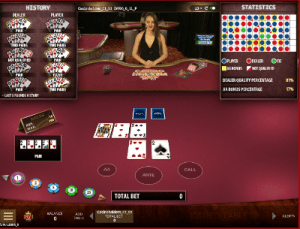 You can choose from two live table Casino Hold’em variants by Evolution Gaming. First up is Live Casino Hold’em with a minimum bet of $0.50 and a maximum of $5000, while the other variant is Ultimate Texas Hold’em with a minimum bet of $0.10 and a maximum bet of $1000. Microgaming offers Live Casino Hold’em available to play at Royal Vegas Casino. There’s three tables to choose from with varying table limits including $10 to $100, $30 to $300 and $50 to $500. Keen to give online Casino Hold’em at try? Sign up for an account at Royal Vegas Casino where new players can claim up to $1200 in matched deposit welcome bonuses to use on a wide range of casino games.